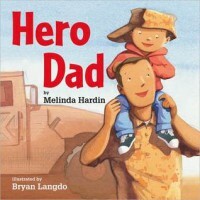 Hero Dad by Melinda Hardin is a lighthearted yet meaningful children's book. This book highlights the heroic characteristics of a soldier from the perspective of a child and does an excellent job of highlighting their duties as a soldier. It is child friendly while still being informative. The illustrations do an excellent job of showing the meaning behind the text for readers who may not understand the vocabulary. I would use this book in class when students are learning about descriptive words or even when discussing occupations. This book could also be used during a lesson discussing the military around Veteran's Day.